Jerome (Cameron Monaghan), who, despite all appearances, is not the Joker. Probably. Ever since Gotham introduced Jerome Valeska in season one, a character that over the course of the show acted increasingly like the future Joker and dressed like the future Joker and laughed like the future Joker and also had his face cut off and stapled back on like the Joker of the comics, fans have wondered if he was, in fact, the Joker. He’s not. But we might have met Gotham’s Joker last night anyway. If you watched last week’s episode, then you know that it was revealed that Jerome had a twin brother named Jeremiah, and it didn’t take the World’s Greatest Detective to figure out how this was going to go down, especially after the Scarecrow showed off his new toxin which is basically Joker gas—it turns its victims pale, gives them an unnaturally giant, CG-assisted grin on their faces, and makes them laugh themselves to death. After turning the sparsely attended Gotham Music Festival into a giant hostage situation, Jerome demands that Gordon bring him Jeremiah and Bruce Wayne or else he’s going to kill the mayor, police commissioner, and a couple other rich and powerful Gothamites. Gordon has a plan which involves Jeremiah and Bruce surrendering to Jerome, which immediately fails and gets a lot of police officers killed. Eventually, Gordon learns that Jerome is going to spray the crowd assembled with his Joker gas, and solves the problem by shooting people, as per usual. Eventually, Gordon shoots Jerome so much he (sort of willfully) falls off a building and dies, almost exactly like Jack Nicholson’s Joker in the 1989 Batman movie, which is a genuinely nice homage. 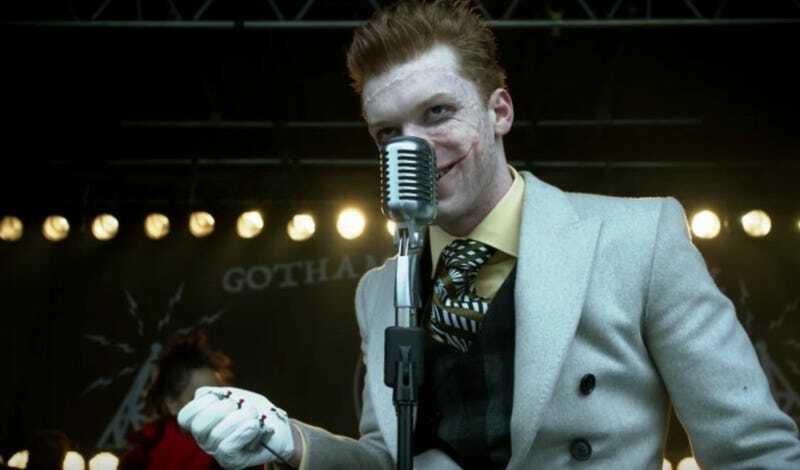 Jeremiah Valeska, the good twin of Jerome, except maybe not. With Jerome dead, who could the future Joker be? Well, Jeremiah, of course, who finds a present purportedly from Wayne Enterprises on the desk of his impregnable bunker deep in the woods—shoulda been your first clue, kid—and opens it, and gets a big dose of “special” Joker gas in the face which makes him pale, gives him a giant grin, and starts him laughing hysterically. (I couldn’t tell if the gas also turned his hair green, which would be inexplicable, but it’s Gotham, so why the hell not.) Couple that with Jerome’s repeated declaration that Jeremiah is also bad and a killer just like himself, deep inside, behold... the Joker. Or maybe not? The best thing about Gotham is how much it’s willing to do anything, so this new laughing psychopath who looks exactly like the Joker and will obviously also act exactly like the Joker may not be the Joker. I mean, Jerome also has acted completely like the Joker for years, and he wasn’t the real deal. Jeremiah could fulfill the exact same role, and then get replaced with another guy! In fact, Jerome has already come back from the dead once—even though this death felt final, you’d be a fool to think Gotham wouldn’t bring him back if it wanted to. Oh, also this episode: Alfred gave Bruce his first matte black car, an obvious precursor to the Batmobile; the show finally brought out a blimp; not one but two heads graphically exploded in an 8:00 pm ET timeslot, as well as two people graphically turned into ash; Barbara may be the reincarnation of someone who dated Ra’s Al Ghul in the 17th century, and I am 95 percent certain the band at the music festival were playing a snippet of the Batman ‘66 TV show theme song on repeat.